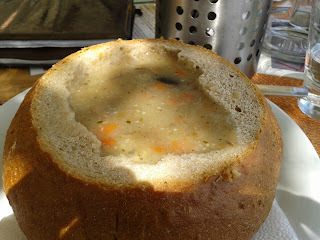 Giving up on being bread alone - it's grown into a soup bowl! Way back in October, I went to England for a long weekend. Some things in my life journey had led me to an impasse. I was stuck. So I went to the place I knew where I could get help, at Christ Church in Deal. This church has an outreach program with weekend workshops, books, CDs and other helps. They call this program Rapha. The people there are amazing and have been a wonderful, integral part of my life pilgrimage, giving me tools to understand the kind of journey I am on, as well as help along the way. The people who live there are really generous. I have even heard them say publicly that they would welcome anyone to come there for an extended stay - ANYONE who really wanted help from them, whether they had the money to pay for it or not. I have met amazing people who have gone there to live because they were stuck in their lives, sometimes from really difficult illnesses like bipolarity or clinical depression. Some of these people arrived at Christ Chuch's doorstep, broken down and broke, without a plan as to how they were going to pay for the help they hoped to get. I suspect that the community has helped more than one person out financially as well as helping them to knit their lives together again. Staying there to live has never been an option for me, but I do keep going back there for the workshops, which have carried me a long way. In October, I was pretty desperate, but the people there didn’t think my best option was to stay there. I had a job and a husband, and a son who keeps coming back home for a week or a few months. Staying there just didn’t seem like a good option for me. They pointed me in another direction. “Noreen, go to America. Go visit your family. Take your time. That will do you good.” So I did. I went on a long journey to the United States, and wrote a little about this in my last posting. Part of that journey was a 5 - ½ day sojourn at Breakthrough, a holistic treatment center in Pennsylvania. There, one of the therapists told us we would be taking a journey into “inner space”. At Breakthrough I learned more about how I got stuck and how to get unstuck by literally rewiring parts of the brain. This is one of the concepts they talk about at Rapha. I got practical help so that I could do this, and am in the midst of it. I’m one of those people (are we all like this?) who will probably continue to need help as long as I live. Perhaps this is just part of being humans. Humans are needy people. I had always hoped that my blog would be a place where I could share about this journey into “inner space” as well as the physical sorts of journeys we go on. The only problem with this is that when dealing with life’s problem areas, it seems that other people are always part of the reason or at least the occasion for these problems. How can you write about problems without harming those closest to you? Blabbermouths may feel better for a while, but what happens to all the people whose reputations they've damaged in their complaints? I’m going to attempt this without going into detail about the people who cause or who have caused me pain. This subject is too important to ignore, since it is really the essence of my life – how to consciously embark on a thrilling life journey, consciously braving the storms as well as the sunny days, even talking about them. Storms are just as much a part of life as sunny days. We are probably all partly sick and partly well. But I, for one, would really like to live more and more in health, if at all possible. I once read a book about mental health where the writer stated that the main cause of mental illness is that the person will not accept the awful reality that has invaded this person’s life. Better to deny it, we tend to think, better to find some other outlet than to admit the unspeakable, horrible, awful truth. But that is what makes us ill. The only hope for getting well is to let hope for the change we long for die. That is one of the truths I have come to see. We will not get well until we give up. 1. Get in touch with me. What do I need? What do I feel? Own it. Feel it. 2. Grieve over that which got lost. 3. Start giving it to myself, believing that God is making this possible, allying myself with the God who is good and kind. 4. Get. Accept. Accept the things that cannot change, accept myself, those who have hurt me. Accept the love of those who can give me some of what I need. Accept the gifts that God and life have for me. 5. Get on with life. 6. Give it away to others. I’ll be spending the next few postings breaking these down, sharing with you what each point means to me. Until next time. I wish you travel mercies. Looking very much forward to reading your next entries. I find it helpful for dealing with my problems as well.